New Delhi, Dec 1: The agencies have stepped up efforts to track down a top member of the Jamaat-ul-Mujahideen, Bangladesh. The man in question is Idris and he has been tasked by the JuMB to revive the Indian Mujahideen which had gone bust after several of its top members were arrested in a series of operations undertaken by the police and the Intelligence Bureau. Even as the West Bengal government has rejected an NIA probe, members of the agency say that the probe here onwards is going to be extremely tough. By the time our officers reached the spot there was a teething hurry on part of the local police to destroy the evidence. We have now been told that a large consignment of the bombs were taken away to the banks of the Damodar river and detonated. 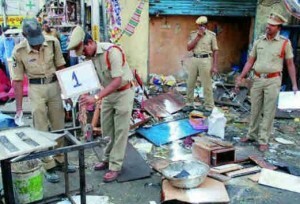 The bomb disposal ‎was very much present and could have contained any explosion if that is what the local police was worried about, the NIA says.